Use this resource to help your students practice their vocabulary words. I like to use this in their word work center. It is simple enough for struggling students to complete on their own and allows higher achieving students to use their creativity. I particularly like this foldable for my students who aren’t quite ready to write their vocabulary words in a sentence. 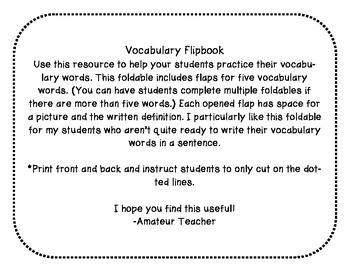 This foldable includes flaps for five vocabulary words. 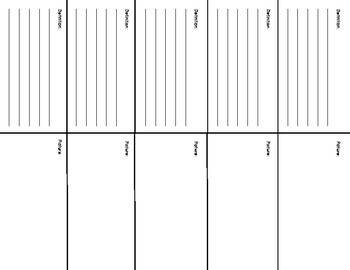 (You can have students complete multiple foldables if there are more than five words.) Each opened flap has space for a picture and the written definition. 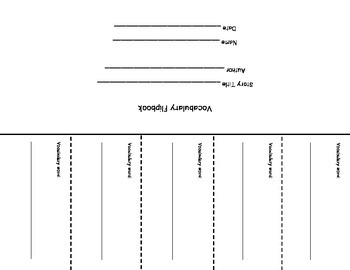 *Print front and back and instruct students to only cut on the dot- ted lines.